The B.O.O Phu Ninh Water Treatment Plant Joint Stock Company and Licogi 16 Joint Stock Company yesterday held a groundbreaking and signing ceremony of engineering-procurement-construction (EPC) contract to build the Phu Ninh Mineral Water Plant at Chu Lai Open Economic Zone in Quang Nam. At the groundbreaking ceremony of the Phu Ninh Mineral Water Plant. The construction is built on 15 hectares of land, pluming water source from Phu Ninh Hydropower Plant and Ban Thach River to Chu Lai Open Economic Zone, Tam Ky city, Duy Xuyen, Thang Binh and Nui Thanh districts with total capacity of 300,000 cubic meters a day. The Phu Ninh mineral water factory will exploit 100,000 cubic meters per day in the period of 2017-2024. It is expected to be doubled its capacity to 200,000 cubic meters per day from 2020 to 2025 and 300,000 cubic meters per day after 2030. It targets to actualize plan for water supply of Quang Nam province by 2030, responding to the demand of using fresh water in the localities, and ensuring requirements on technological and quality regulations after water treatment. The factory is built under the Build-Own-Operate (BOO) contract with an implementation period of 50 years and total investment capital of VND 1,221 billion. As plan, the factory will begin releasing water in October, 2017. 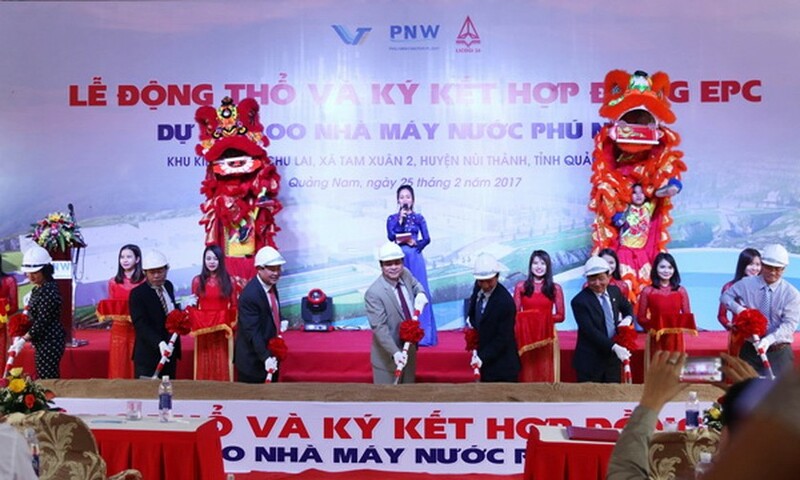 On the same day, main investor, constructor and joint- venture companies signed a construction contract of the Phu Ninh mineral water factory. Deputy Chairman of the Quang Nam People’s Committee Huynh Khanh Toan said that the factory will supply water source for the entire Chu Lai Open Economic Zone and Tam Thang Industry Zone and local people living in Duy Xuyen, Thang Binh, Nui Thanh district and Tam Ky city after it is scheduled to put into operation.